The world’s oldest wild bird, Wisdom the Laysan albatross, has once again returned to her breeding grounds, and she has laid another egg. She is at least 68 years old, but doesn’t look a day over 6. 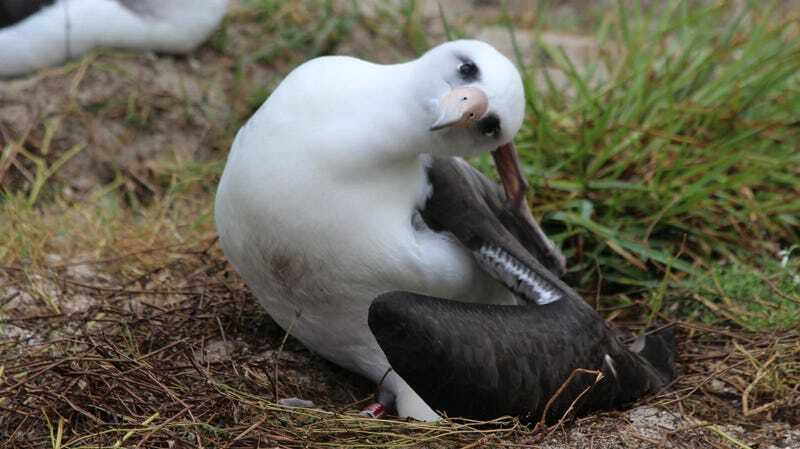 Laysan albatross are sea-faring birds found in the northern Pacific Ocean that breed in the northwestern Hawaiian islands, nesting in enormous breeding colonies. Scientists first banded Wisdom as an adult in 1956, meaning that she’s at least 68 years old. She successfully reared a chick last year—and has returned this year to raise another egg. Wisdom in 2017, with her chick. Wisdom’s story began in 1956 when biologist Chandler Robbins banded her near a U.S. Navy barracks. She was already an adult, meaning she was at least 6 years old at the time. Scientists band birds in order to track them and monitor their populations, and you can occasionally spot bands on birds found in the wild. Wisdom was one of 8,400 albatross banded that year and one of hundreds of thousands of Laysan albatross breeding on Midway Island, according to a U.S. Fish and Wildlife Tumblr post. It was Robbins who spotted Wisdom again 46 years later while surveying the nesting site. Biologists were able to read the original number on her band. Laysan albatross breed in large colonies, returning to the place they were born every year. Midway consists of two islands, on which 3 million seabirds, including 1.2 million albatross, nest. They look for a mate at around 5 years old, just before reaching adulthood. Albatross lay one egg and raise one chick a year, and if you haven’t seen it, they perform an incredible courtship dance. Wisdom with her new egg. Wisdom turned up at her original nest site on November 29 and has recently laid an egg. She and her partner, Akeakamai, raised a chick last year. She only met this mate back in 2006, at a spry 56 years old. Like many animals, Laysan albatross are threatened by human activity. Invasive mice have been known to attack the birds, and their population is still recovering from hunting in the early 20th century. They’re also prone to eating plastic, as their diet consists mainly of things floating on the water’s surface. Wisdom continues to be a symbol of animal resilience—and looks really good for her age. We wish Widsom luck with her newborn and hope to see her again next year for a nice 69th birthday! The world&apos;s oldest wild bird has given birth!